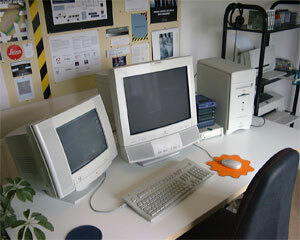 In 1996 I purchased my first system based around and Apple Performa 6500 and two AppleVision AV monitors (picture right). Since then I have owned various Apple computers including the first generation of PowerMac G4, a PowerBook G3, a 15" PowerBook G4, a 12" PowerBook G4, a 13" MacBook and now have 15" MacBook Pro (through work) and a 27" iMac. I have taught all levels of Photoshop since 1997 and became an Adobe Certified Expert in 1998. Passed the Adobe Certified Expert exam in 2000 and have taught vector illustration modules. High level of expertise surrounding the production and use of PDF including the addition of interactive navigation and form elements. I knew v7 of this application ‘inside-out’ but have then moved to using InDesign. I have taught Director to advanced level (e.g. a group of students for six hours per week over an academic year). Confident hand-coding Lingo. I would hope this site speaks for itself. Have focused on CSS structuring and accessibility. Had taught an advanced Dreamweaver evening course for two years. Experience of this application since its introduction. Particular expertise in the motion graphics (i.e. the AfterEffects-like elements) aspects of the application. Plus lots of other applications not worthy of individual mention. I also have experience of implementing one of the first UK OSX server-based networks in 1999.